Most people choose to visit Heidelberg during summer between May and September when the climate is at its most favourable. In the winter months, the weather in Heidelberg is rarely extreme, with only light overnight frosts form December to February. By the time that April has arrived, the days are beginning to get longer and the overall climate and temperatures regularly rise to 16°C / 61°F on the best days. Many famous guests have left behind enthusiastic comments about Heidelberg, and in this way contributed to the myths associated with this fabled city. These people include Achim von Arnim, Konrad Adenauer and Louis Armstrong, Clemens Brentano and Charles Bukowski, Johann Wolfgang von Goethe and Gustaf Gründgens, Theodor Heuss and Victor Hugo, Empress Sissi and Queen Silvia, to name just a few. For Goethe Heidelberg had “…something ideal in its location and its surroundings.” Famous paintings, songs and poems of the German romantic period came into existence here, and have made Heidelberg’s harmonious interplay of nature, tradition and innovation known to an international audience. In the Neckar Valley, where the evenness of the river, the warmth of the red sandstone and the intimacy of the Old Town take the hectic pace out of everyday life, people quickly feel contented. On top of this come the mild climate of the region and the hospitable nature of its inhabitants, who have been open to outside influence for hundreds of years. A walk along the Philosophenweg (Philosophers’Walk), situated above the Neckar and leading into the Neckar valley, is considered one of the most impressive ways of becoming familiar with Heidelberg, which to this day still possesses romantic charm. Many exotic plants such as cypresses, pomegranate trees, palms and pines flourish on this sun-pampered natural dresscircle. For generations, people have been willing to make the short climb to be able to enjoy the famed panorama outlook over the city and the Castle. Just how much the Neckar is part of life in Heidelberg becomes clear if you go to the Neckarwiese (Neckar banks) in warmer weather. The green area on the north bank of the river between the Theodor-Heuss-Bridge and the Ernst-Walz-Bridge serves sun-worshippers, those out on a stroll, dog owners, couples in love, bookworms, Frisbee players and picnickers equally well. That the inhabitants of and visitors to Heidelberg’s Old Town feel comfortable and at ease in this romantic setting is explained not only by its location between the Neckar and the Castle hill, which rises up behind the city as though to give it protection. The structures in the Old Town are primarily built using the region’s native red sandstone. As bridges, towers and gates, borders around open squares, churches, palaces, university buildings and both small and large townhouses, they never radiate stately aloofness, but instead friendliness, warmth, openness and closeness. 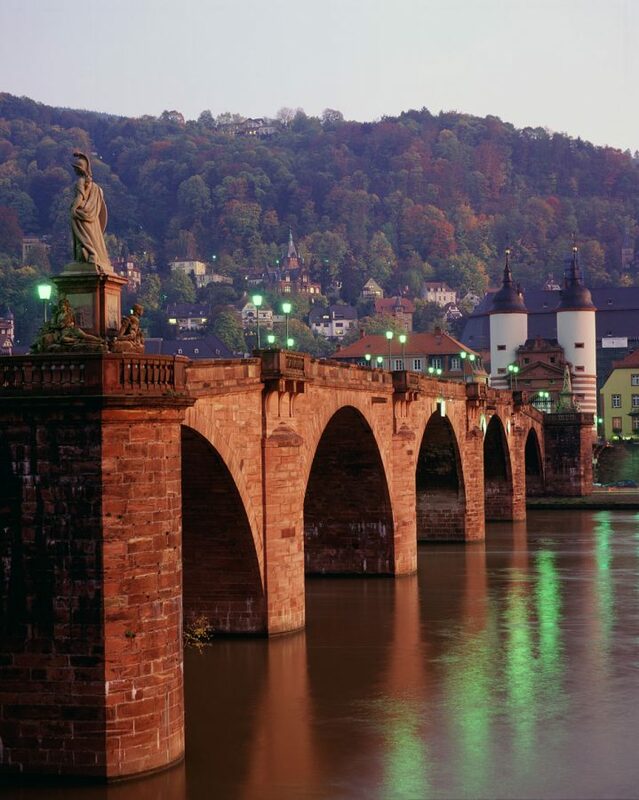 The red sandstone edifices of the Alte Brücke (Old Bridge), historically the first Neckar crossing, and the Heiliggeistkirche (Church of the Holy Spirit), Heidelberg’s largest church, are thus also among the city’s sites of interest. The same can be said for the Hotel Zum Ritter Sankt Georg, whose splendid Renaissance façade cannot be overlooked. 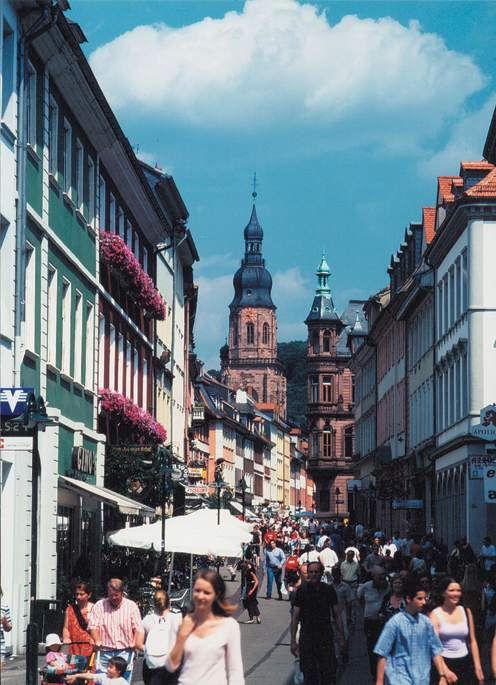 The numerous dreamy alleyways, nooks and crannies give Heidelberg’s Old Town its cheerful flair. Anyone who strolls along the Untere Strasse or simply casts a brief glance into the branching narrow lanes while walking along the Hauptstrasse, Europe’s longest pedestrian zone, cannot help but sense this enchanting atmosphere. Gabled roofs of brick and slate in many shapes protect Baroque buildings on medieval foundations. A glance at the city’s rooftops shows that more than 800 years of history have formed an appealing city setting of modest dimensions. The Old Town’s historic structural center, such as the Universitätsbibliothek (University Library), the Marstallmensa and a number of lecture hall buildings give evidence of the great significance of the university for the city. A bewitching mélange of hotels, restaurants, cafes, businesses and boutique can be found throughout the Old Town. 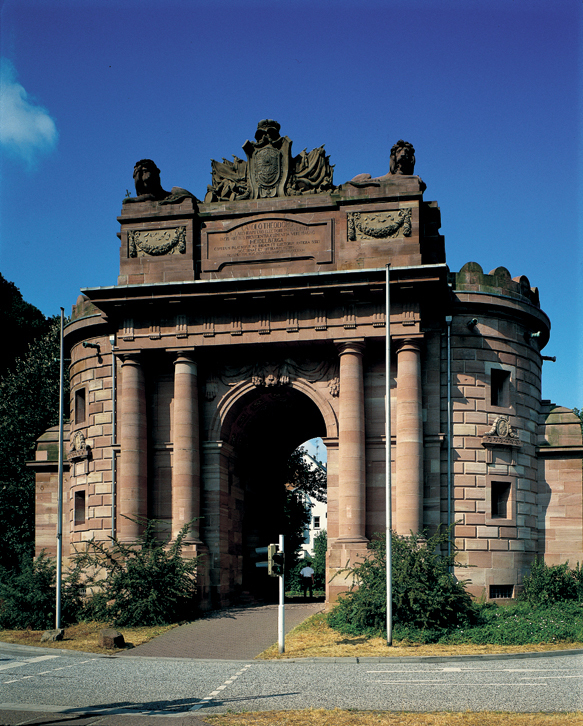 The triumphal arch in honor of the Prince Elector Karl Theodor, located at Heidelberg’s very east, was erected from 1775 until 1781 and designed by Nicolas de Pigage. When the foundation-stone was laid on October 2, 1775, the Prince Elector personally attended the celebration. He took a personal interest in the construction work and had the architect draw a new plan which finally unified elements of the preceeding three sketches. The final result was a neo-classical building following the tradition of Roman triumphal arches, crowned by four lions, the traditional symbols of the “Kurpfalz”. Portraits of the Prince Elector and his wife are located under the princely hat in the center of the top facing the city from the west. The center piece pointing beyond Heidelberg contains a written dedication topped by a weapon trophy with the Kurpfalz Coat of Arms. The sculptures were created by Peter Simon Lamine. The triumph arch was never totally completed. A fountain with a statue of Hercules on a column, built between 1703 and 1706, forms the centerpiece of the Market Square. This hero of Greek myths, known for his strength, symbolizes the heroic efforts that Heidelberg’s residents made to rebuild their devastated city in the years after 1700. The Hercules statue in the fountain today is a replica, however; the original is in safekeeping in the Kurpfälzisches Museum. Twice a week an open-air market takes place in the Market Square. The rest of the time – during the warm months of the year – it holds several outdoor cafés. Folksongs, famous paintings and countless entries in Heidelberg’s guest books prove it: The Neckar is the lifeblood of the city. On its 367 km journey from its source to its mouth, the river shapes large stretches of the countryside. However, the best known section of the river lies in front of Heidelberg’s Old Town. The view from the Philosophenweg (Philosophers’ Walk) across the Neckar to the Castle and the Old Town – made so famous in millions of travel guides, picture books and vacation photos –shows: The Neckar and Heidelberg belong indivisibly together. Precisely at this junction with the Neckar in the heart of the old Town lies the historic Kongresshaus Stadthalle (Convention Center) with its rooms for events and conferences. In the coming years it is to be expanded into a modern conference center, in order to make Heidelberg even more attractive as the place for international gettogethers to be held. In front of the Convention Center the traditional “Weisse Flotte” of the Rhein- Neckar passenger ship company has been offering excursions to the picturesque Neckar valley for several generations. A trip on the silently gliding solar-powered ship “Neckarsonne” is another way to take in the sights. Sailing boats can be admired in the yacht harbor, and on the north bank of the river electric or paddle boats can be rented. The Neckarwiese (Neckar banks), or Neckar Park, is a welcome destination all year round for many different sports and recreational activities – or simply for relaxing. But the Neckar is also an important natural force, providing energy to tens of thousands. The five hydroelectric power stations near Heidelberg provide 14.2 megawatts of all-important green energy to the city each year. And all the potential benefits of the shared life of city and river have yet to be exhausted. That is why Heidelberg has a vision: “City on the river” is the title of the project now currently under development. National highway 37, which until now has separated the Old Town and the Neckar from each other, is to be routed through a tunnel along the bank of the Neckar, to make room for a riverside promenade. In this way city and river would grow back together again and additional space and quality of life be created. “The city in its setting and with its entire surroundings has, one may say, something ideal…”(Johann Wolfgang von Goethe, 1797). Poets and artists from all over the world have immortalized in verse and paintings the romantic theatrical backdrop of Heidelberg. Classical and widely extolled is the view from the elevation of “Philosopher’s Way” onto the Old Town and the Neckar, with the majestic castle ruin seated enthroned above it all. Where Goethe, Joseph von Eichendorff and Hölderlin once strolled along winding pathways through vineyards, today a hiking trail conducts the wanderer amid a world of small private gardens and lush foliage. Since the destruction in 1693 during the Palatinate War of Succession and the subsequent baroque reconstruction in the eighteenth century, the layout of Heidelberg’s Old Town has remained unchanged. To the greatest possible extent, Heidelberg was spared destruction in the World Wars, and is today a unique cultural landmark well worthy of discovery. 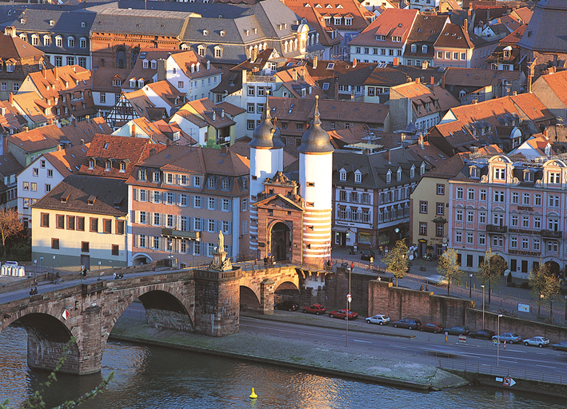 Not only in its geographical and architectural endowments is Heidelberg ideal: this European city of scholarship and economic strength has a direct connection to the Frankfurt airport and is a lively gateway to the exploration of Europe. Within the twisting alleyways of the Old Town reigns an animated bustle of students and university affiliates, tourists and long-established Heidelbergers. The avidly frequented little cafés and restaurants resound with the sounds of merry or intense exchanges. 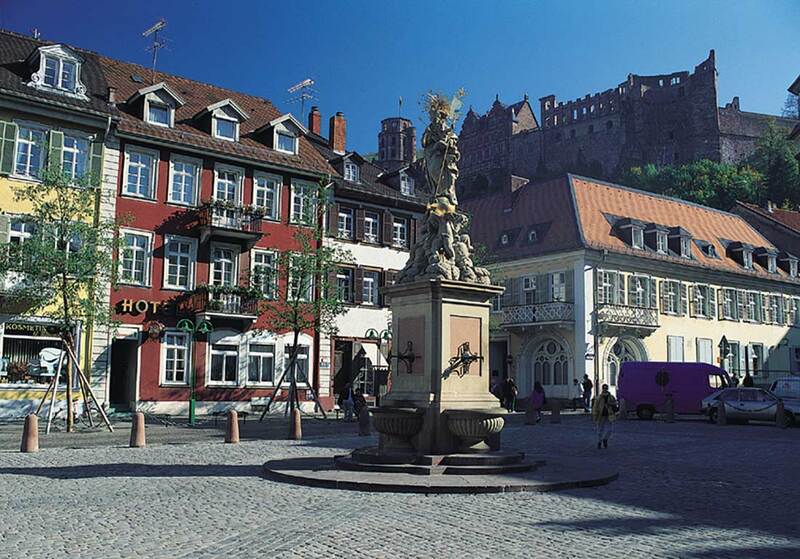 On Heidelberg’s public squares, annual festivals for classical music, jazz, film, theater, and literature take place. A special highlight in December is the large Heidelberg Christmas Market: with more than 140 colourful stands and an ice skating rink, the city is bathed in a glow of light for the month before Christmas. In summer, the three evening illuminations of the castle, with fireworks bursting above the dark hills, castle, and town, are a not-to-be-missed spectacle. The alleyways of Heidelberg’s Old Town have (his)stories to tell: In the vicinity of the student-pub-mile “Untere Strasse” are still to be found above doorways the marks of old trade guilds, the interpretation of which is a fascinating and not uncomplicated guessing game. Chiseled into the outside wall of the Holy Ghost Church, on Market Square, is here and there the symbol of a Brezel, a typical bakery specialty of Germany. By holding his purchased Bretzel up to the symbol, the customer could ascertain whether he had received “his money’s worth.” Already in the Middle Ages, little shop stalls extended between the supporting pillars of the church exterior. Formative for the intellectual life of the city was and is Germany’s oldest University, the “Ruperto Carola,” founded in 1386. For centuries the University has drawn to Heidelberg significant individuals from all over the world, who from here have gone on to make history. In worldwide university rankings, the University of Heidelberg consistently receives an excellent standing. Its international reputation is reflected also in the fact that twenty percent of the student body and ten percent of the faculty are from countries outside Germany. 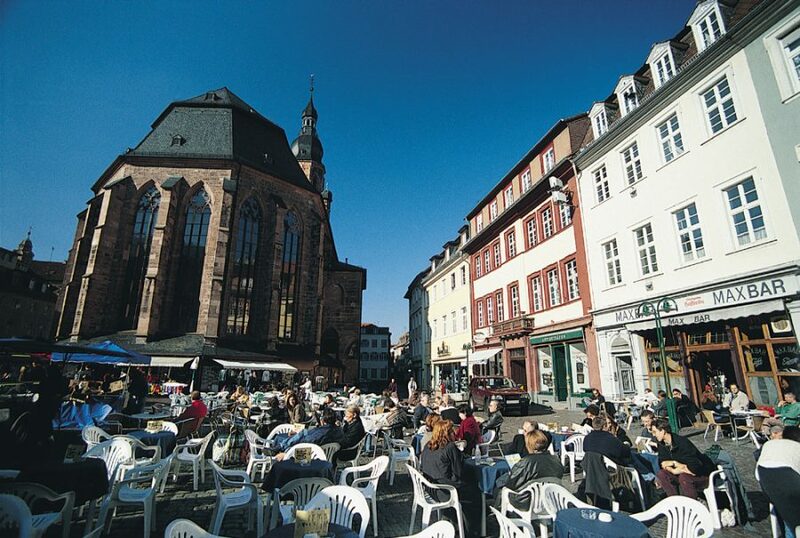 In 2008, Heidelberg was named one of nine “Elite Universities” in the Federal Republic. Currently some 28,000 students, approximately one fifth of the population, are matriculated here within twelve faculties and numerous areas of special research. The life sciences, environmental management, and information technology are the core competencies of Heidelberg as a site of scholarship and economic strength. The European Molecular Biology Laboratory (EMBL), the German Cancer Research Centre (DKFZ), and Heidelberg’s Max Planck Institutes are counted among the best in the world for their fundamental research. From their ranks was chosen this year Heidelberg’s ninth Nobel Prize winner: Professor Harald zur Hausen, who from 1983 until his official retirement in 2003 was on the Executive Board of the German Cancer Research Centre, received the prize for the discovery that viruses are the cause of ovarian cancer. Interested in learning more about Heidelberg?